On a truly spectacular mountain side parcel. Nothing beats the views of the Great Smoky Mountains from this Gatlinburg cabin for rent! In fact, you might not even see the amazing interior as you rush through the cabin to step out onto one of three decks and gaze out over the woodlands toward the Great Smoky Mountains! Wait until you see the view from the hot tub! The great room picture windows and game room glass doors always keep the awe-inspiring mountains front and center. All About the View is for groups up to 12 - so there’s space for the whole gang. No feeling crowded, even at the diner table which seats 12. How about the kitchen? Shinny appliances, gadgets galore, plenty of cookware and tableware- the kitchen enables you to create a culinary masterpiece. Know what else seats 12? The lodge’s home theater! 12 in cinema-style chairs (your local cineplex will never be the same). This 3-story house is yours to enjoy and it’s only 10 minutes from downtown Gatlinburg! 2 Game Rooms: A pool table, air hockey, an arcade with 20 games, a home theater, free WiFi, a large flat-panel TV, and a leather sofa. Sleeping arrangement: 6 en-suite bedrooms. All have a King bed. HDTV with premium cable and a DVD player. 2 include pampering jetted tubs. All About the View is ideal for a half-dozen couples looking to vacation together. Four seasons in Eastern Tennessee! It’s always the right time of year to stay in All About the View. Spring and summer, lush greenery. Autumn, brilliant fall leaves in shades of red, orange and yellow change the palette of the usually green landscape. Winter, playing on snowcapped mountains and Ober Gatlinburg Ski Resort & Amusement Park will result in snuggling in front of the cabin fireplace in the evenings. Locals like to say that Gatlinburg has Goldilocks temperatures -- never too hot or too cold. Take time to do some “nothing.” Kick back on one of the deck rockers and ease into vacation mode. Listen for the singing of larks, wrens, and warblers. The hooting of distant owls at night is a real treat. 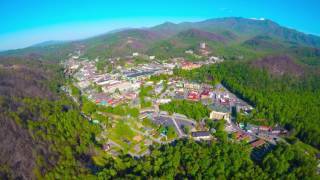 When it’s time to see the sights and live like a local, you can try fishing for trout in a nearby stream, hike the Smoky Mountains, play in the new Anakeesta outdoor entertainment complex, Ripley’s Aquarium of the Smokies, thrill rides, shops, distilleries. Since you book directly with us here at Jackson Mountain Homes, we can make sure your Great Smoky Mountains National Park visit is the best it can be. We’ll have other suggestions for you too - the Great Smoky Arts & Crafts Community is popular with our guests. 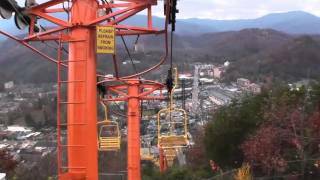 All About the View is less than 10 minutes from attractions-packed downtown Gatlinburg - unlimited activities and attractions! Meet 350 species of underwater creatures at Ripleys Aquarium of the Smokies; an authentic historic experience awaits at the Titanic - World's Largest Museum Attraction; for a stunning sightseeing experience, don’t miss the Ober Gatlinburg Aerial Tram. The “family” shows in the Gatlinburg and Pigeon Forge include Dixie Stampede Dinner Show; The Killbillies Dinner and Show (you help solve the mystery murder); Celebration! Dinner Show offers musical numbers, talent, showmanship, and acrobatics.